DJ Dukesherer’s path to becoming an author was less direct than the one that led him to surfing. 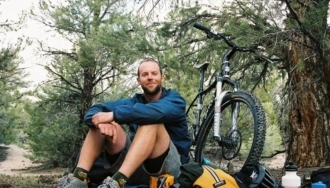 Paddling the deep blue waters off the coast of Playa Del Rey with his father were a defining element of his childhood. Mr. Dukesherer’s ocean roots sunk deep into the sands of Playa Del Rey. Through his years, he’s watched as sacred spots are paved over, developed, and forgotten. What’s left of so many of these places is only memory. 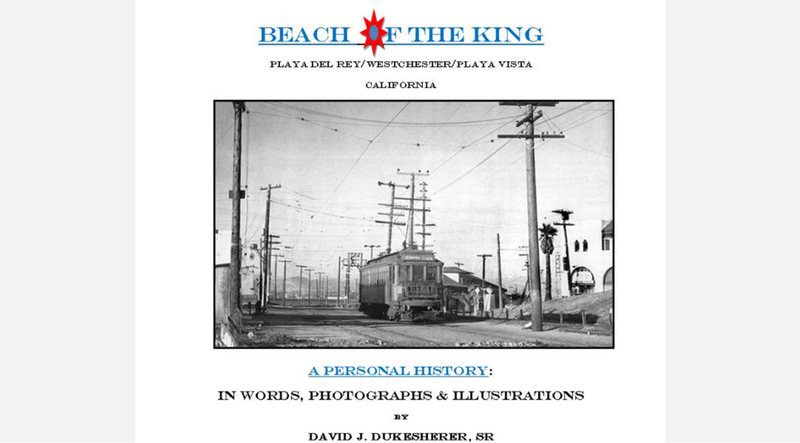 In what can only be called a labor of love, he’s put together a paean to this treasured homeland: Beach of the King: Playa Del Rey/Westchester/Playa Vista, A Personal History. Beach of the King is part history, part memoir, but all heart. As DJ says about his efforts to preserve what remains of this treasured spot, “I am looking to find a way to bring some positive education to the area, in hopes that we can avert any further madness.” In the spirit of that, he’s put together a local library series to support his self-published book, with a standing exhibit in 4 parts beginning July 12, 2008 and running through June 2009. The series is being sponsored by the Los Angeles Library, Playa Vista Branch. If you’re a local and would like more information, please leave your comments/questions below. When I was very young boy, my parents took us to the beach whenever they could, and we would spend long days on the beaches of Playa Del Rey, in Southern California. We knew three beaches there, at Dockweiler State Beach: Gillis Beach, Toe’s Beach and The Pits. It was like having a resort in your own back yard. We lived, then, about three miles from that beach. 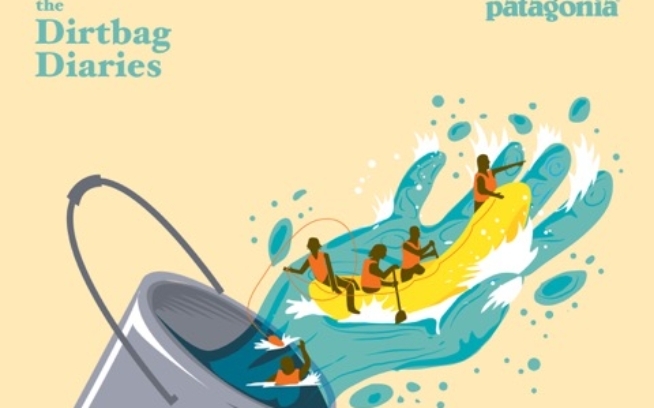 In those days, my father owned a very long–perhaps 18 foot–turquoise and speckled-white, hollow paddle-board. On sunny-hot summer days, he would paddle out at old Toe’s Beach in Playa Del Rey, and cover miles on it; sometimes going as far south as Malibu, which was still accessible in those days. This was before the new channel was dug– that now separates Playa Del Rey, from Marina Del Rey and Venice Beach. My father claimed that together we would one day paddle the 26 miles to Catalina Island, just as ancient native mariners had traveled to there and from that exact same spot in small hand-built boats . . . . Some journeys are never made, while others that we actually start take new directions. At a certain age, those dreams you have as a child, if not fulfilled, must be given up and you must move on. But many memories, some which haunt me still, remain . . . . Built in a nest of land beside an ancient inland sea and dry lakebed, and surrounded by high coastal bluffs, the Los Angeles International Airport and The Pacific Ocean, Playa Del Rey and Playa Vista comprise the jewel in the crown of what was once a massive Spanish Land Grant. Bordering its northern border, a meandering and often misunderstood Ballona Creek: the former Los Angeles River, now channelized with boulders barged in from Santa Catalina Island, dissects the remaining wetlands of the area. The largest man-made pleasure craft marina in the world: Marina Del Rey, follows the route of the creek to the sea. The area, first inhabited by an indigenous people that arrived in North America about 8,0000 to 12,000 years ago, changed little for the great majority of that time. Of course most of North America remained unchanged before the arrival of the European, but as late-1800 California beach towns grew, attempts to develop Playa Del Rey were met with a series of disasters that I will outline in these chapters. These events resulted in leaving behind a patch-work of small villages and neighborhoods that comprise the town today; a town that is now surrounded on three sides by some of the most densely populated area in the United States. Our tribe surfed the beaches here, and we grew up on them. Playa Del Rey seems to exist in spite of itself; and does so with very little regard to its Los Angeles parent. Later, I lived just off the beach, and there were times that I had to remind myself that I wasn’t on vacation. The town can do that to you. I can think of no finer place to live on the planet. Without a doubt, the largest and most controversial recent change began in 1989 with the development of the former land and headquarters of the Hughes Aircraft Company; purchased by aviator Howard Hughes in 1940. The Playa Vista development, built at the foot of the Playa Del Rey/Westchester, California bluffs, sometimes called the Kentwood Bluffs, has amalgamated a group of disjointed: naturalists, dismayed logisticians and urban planners, ecologists and preservationists , whose rallying cry of “no more development,” has grown to sometimes hysterical proportions. In the end, Playa Vista continues to develop alongside its older cousin, Playa Del Rey, creating one of the most interesting and hotly contested regions on the Westside of Southern California. However, this town which was once four or five separate towns, has eventually merged back into one. And despite the many changes, over thousands of years, the Pacific Ocean and Ballona Creek have kept a constant metronome-like rhythm, counting time with a certain and promising cadence. . . .
D. J. “Duke” Dukesherer is a member of the Los Angeles Historical Society, the Los Angeles Conservancy, and the Westchester-Playa Del Rey Historical Society. He is also the Founder of Full-Count Productions and a writer with many irons in the fire. He is married with three children, and lives in the Westchester/Playa Del Rey, California area.